Aurora Dental provides dental crowns in Aurora, OH. Call 330-562-3400 to learn more and schedule your appointment. While a filling is the right choice for mild to moderate tooth decay, more extensive damage cannot always be treated with a filling. In this case, we will likely select a dental crown. Highly functional and aesthetic, dental crowns blend seamlessly with your natural teeth while allowing you to bite and chew as normal. Crowns protect the remaining healthy structure of the tooth, keep the jawbone strong, and help to stabilize the neighboring teeth. First, we will take impressions of your teeth and bite (the way your teeth come together) to make sure your new crown will blend correctly with your natural teeth. We will then remove all decay and damage and prepare your tooth for the crown. We will then take impressions of your prepared tooth to ensure a proper fit. You will go home with a temporary crown to wear while the dental lab custom crafts your new permanent crown. When your permanent crown is ready, you will return to our office. During this visit, we will place the permanent crown and securely bond it to your prepared tooth. Dental crowns can last for decades with proper care. Dental crowns come in four basic types, each with its own benefits and drawbacks. We will help you select the type that is right for your needs, preferences, and budget. Ceramic crowns are crafted entirely from dental porcelain. Because they are the most natural and aesthetic in appearance, they are generally used for front teeth. However, they are strong enough to be used anywhere in the mouth. 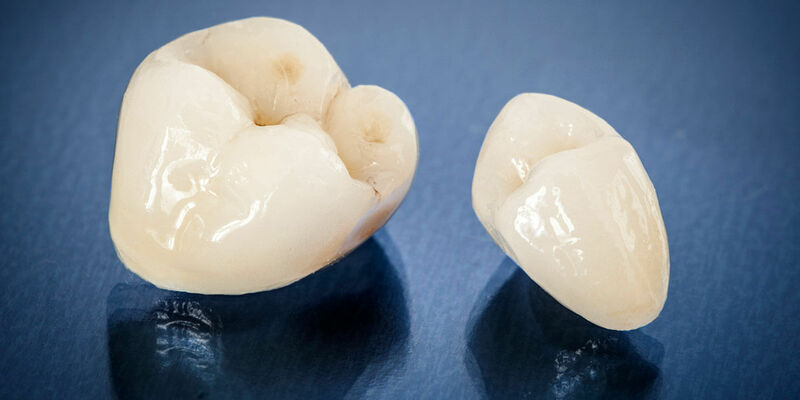 Porcelain fused to metal crowns consist of a metal frame covered in dental porcelain. They are extra-strong to withstand biting and chewing forces, making them an excellent option for molars. However, they are not recommended for front teeth, as the metal frame can create a dark line along the gums. Some people choose gold alloy crowns for front teeth due to their unique aesthetics, but they are most often used for back teeth that need a bit of extra strength. They are an especially good choice for people grind their teeth, as the strong gold alloy is unaffected by grinding. Base metal alloys are corrosion resistant and exceptionally strong, making them an excellent choice for back teeth that would otherwise need to be extracted. However, they are not aesthetic at all, so they are generally not used for teeth located further forward. We will talk through your options to help you choose just the right type of crown. Regardless of which type you choose, we will work hard to ensure that your new crown fits well, feels comfortable, functions as it should, and blends well with the rest of your teeth. We are not happy with your crown until you are.